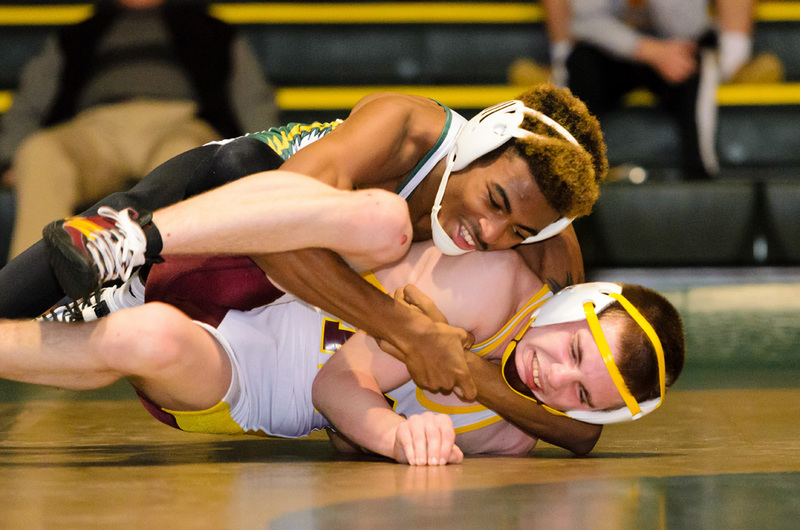 Ta’Jon Knight works his opponent to his back during a match earlier this season. An injury-depleted IR had jumped out to an initial 21-0 lead, but Central recovered through the middle weights, en route to a convincing 42-30 decision in the Henlopen Conference divisional crossover match. The Indians got things rolling early at 106 pounds, with Chris Saylor decking Central’s Gunnar Abbott at the 3:36 mark. IR’s Ian Shaubach followed that up with a technical fall over Dylan King at 113 pounds. Shaubach made it look easy with his 16-0 score, getting the stoppage at 5:44. Will Rayne continued the Indians’ early efforts with a 14-4 major decision over Central’s Mason Ankrom, to make it 15-0 IR. It became a four-pack of wins for IR when Ta’Jon Knight got the slap over the Knights’ Tyler Hudson at 2:25 in their 126-pound contest, to make it 21-0. That early success came to a crashing halt, though, when the Indians’ middleweights struggled. The Golden Knights ran off eight straight wins, including six by pin-fall, to erase their deficit and build an insurmountable 36-21 lead. IR’s Zach Schultz picked up a pin at 220, over Central’s Hiram Lasher at the 3:01 mark, and Ramond Turner closed out the match with a 7-3 decision over Tyler Farr at 285, for the final verdict. “We also were able to get some very good individual match-ups in this dual,” continued Windish. “Chris Saylor picked up his third win of the season over Gunner Abbott,” he said of the 106-pounder. And, at 120, “Will Rayne picked up his second win of the season over Mason Ankrom. Zach Schultz bumped up to 220 and got a pin over Hiram Lasher. The Indians — sitting at 13-4 on the season — were scheduled for a non-league contest with Middletown on Monday, Feb. 4, but that match was canceled. On Wednesday, Feb. 6, after Coastal Point press time, IR was set to host Delmar for Senior Night, in their final dual meet of the regular season. Results of that contest will be available on the Coastal Point sports Facebook and Twitter pages.